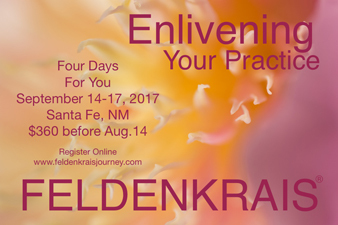 These 12 Awareness Through Movement® lessons were taught live in a 4-day workshop entitled Enliven Your Practice through the Feldenkrais Method® taught by Diana Razumny in Santa Fe NM in September of 2017. These lessons are woven together in a way that highlights the breath, eyes and imaginary lines. The use of the eyes and lines cultivates the powerful tool of the imagination that is fundamental to this method. The overarching theme of the 4-day workshop was finding ways to bring the learning into daily and specialized activities. This wide variety of lessons were taken from the Awareness Through Movement book by Dr. Feldenkrais; some that he taught in Tel Aviv on Alexander Yanai Street; and from his Amherst and Esalen trainings. One lesson is taught via recording by the late Dennis Leri. And one of the eye lessons is taken from the late Jack Hegge’s series.